An increasing focus of organizations across the globe, environmental sustainability has become a central issue that most businesses must address. Is your organization committed to managing its environmental footprint? Show your commitment with ISO 14001:2015 Certification. Achieve the standard. Get ISO 14001 Certification today. What is ISO 14001 – Environmental Management? Certification to ISO 14001:2015 tells the world that you are committed to developing and implementing an environmental policy and objectives that take into account legal and other requirements as well as your significant environmental aspects. With environmental managements systems now found throughout the world, ISO 14001 certification applies to any business or organization — regardless of type, size or product. Why Get ISO 14001 Certification? Pre-assessment is an optional service that is offered for companies that wish to get the highest possible understanding of their readiness prior to undergoing a certification assessment. The certification audit has two parts stage 1 and stage 2. The objective of these two audits is the confirm your companies Quality Management System adheres to all the ISO Requirements. Upon acceptance by the Certification Committee, QSR issues a Certificate of Registration that is valid for 3 years and enters the newly certified organization into QSR’s List of Registered Firms. Surveillance audits are conducted each calendar year to ensure compliance with the standard. Prior to the expiration of your ISO certification, QSR will perform a re-certification audit. This will examine your quality management system in its entirety for overall effectiveness. 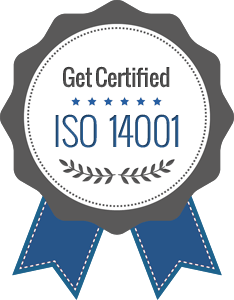 Get ISO 14001:2015 Certified today. Define an environmental policy appropriate to the nature, scale, and environmental impacts of your activities, products, and services. Identify the environmental aspects of activities, products, and services that you can control and/or influence and determine those that can have a significant environmental impact (including those related to suppliers / contractors). Have procedures in place to identify applicable environmental legislation and other relevant requirements, determine how these apply to your environmental aspects and keep this information up to date. Implement effective controls to meet your commitment to comply with applicable legal and other requirements. Define environmental objectives and targets that are measurable, where practicable, taking into account legal requirements and significant environmental aspects with programs in place to achieve these objectives and targets. Ensure that people working for or on behalf of your organization are aware of the requirements of the environmental management system and that they are competent to perform tasks that have the potential to cause significant environmental impacts. Implement procedures for communicating internally, as well as responding to and communicating (as necessary) with interested external parties. Ensure that those operations associated with significant environmental aspects are carried out under specified conditions and monitor and control the key characteristics of operations that can have a significant environmental impact. Establish and (where practicable) test procedures to address and respond to emergencies that can have an effect on the environment. Periodically evaluate compliance with applicable legal and other requirements. Prevent nonconformities with procedures in place to correct any nonconformities that occur. Implement effective internal audit and management review procedures. Get started today – Achieve your sustainability goals. At QSR® All of the management system standards that we work with can help you achieve your sustainability goals if implemented and audited in the proper spirit. Talk to QSR’s business development group today to find out which ISO standards provide the best fit with your sustainability program. Discover how ISO 14001 can enhance your business and the best way for you to obtain this highly regarded certification. Obtaining ISO 14001 Certification gives your companies’ management system recognition around the world. QSR is here to streamline certification. QSR is here to help throughout the entire implementation of your environmental management system and simplify the process. Maintaining the certification, continuous improvement and increased performance are easily achieved with our superior customer support at QSR. Achieve the standard. Get ISO 14001:2015 Certification today.